The Institute for Systems Research is administrating an important invitation-only NSF Workshop on Micro, Nano, Biosystems in Arlington, Va., March 30–31. ISR Director Reza Ghodssi (ECE/ISR) is the chair of the event’s organizing committee. 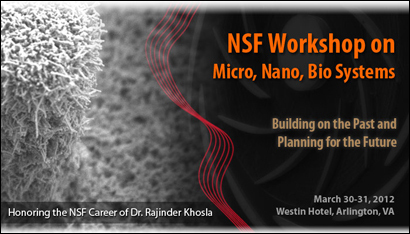 The workshop honors the NSF career of Dr. Rajinder Khosla. The last three decades have been marked by new discoveries, innovations and diverse applications of micro- and nanotechnologies, which have come from both top-down and bottom-up approaches. Today, many devices and commodities we use daily incorporate some form of micro- or nanoscale technology. However, many of the potentials of nanotechnology, particularly the most innovative ones involving self assembly and bottom-up approaches are yet to be realized. •	What are the key impediments of nanotechnology today in meeting global challenges such as universal health care? •	What are the conceptual and fundamental shortfalls? •	What key lessons have been learned? •	What areas of health and medicine can be addressed using nanotechnology? •	What are the most effective areas of interface? •	What technological background should be developed for the new generation of scientists to address these questions at the interface? The workshop will include formal talks, poster sessions, panel discussions, and informal meetings. It features five plenary speakers: Subra Suresh, director of the National Science Foundation; George M. Whitesides, Woodford L. and Ann A. Flowers University Professor, Department of Chemistry at Harvard University; Mark S. Lundstrom, Don and Carol Scifres Distinguished Professor of Electrical and Computer Engineering at Purdue University; Marvin H. White, professor in the Department of Electrical and Computer Engineering at Ohio State University; and James D. Plummer, the dean of the School of Engineering at Stanford University. The poster session features 32 posters, including work by Clark School faculty Agis Iliadis (ECE), Elisabeth Smela (ME), Sarah Bergbreiter (ME/ISR) and Reza Ghodssi (ECE/ISR). There are an additional 10 short oral presentations focusing on fabrication of nano-bio systems, what we have learned about bio using nano, and new application frontiers in nano-bio systems.